The 2019 Champion Racing Oil/RM Racing Lubricants Central PA Sprint Cars were rained out Friday night at Williams Grove Speedway. On Saturday the weather cleared and Blane Heimbach took his first point series win of the year at Port Royal Speedway. Freddie Rahmer was back in in victory lane at Lincoln Speedway for the 2nd week in a row. On Sunday April 7th it was series point leader Danny Dietrich winning the first Champion Racing Oil/RM Racing Lubricants Central PA Sprint Cars point series race of 2019 at BAPS Motor Speedway and his 3rd win of the year.. The series continues this coming weekend with the Ollies All Stars first trip to Central PA for 2019. It will be another three day race weekend with the All Stars and the Champion Racing Oil/RM Racing Lubricants Central PA Sprint Cars venturing to Williams Grove Speedway on Friday night April 12th, Port Royal Speedway Saturday April 13th and Bedford Speedway on Sunday April14th. 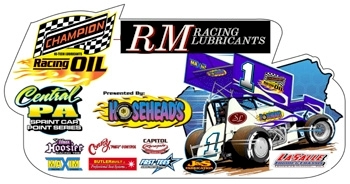 Lincoln Speedway will also have a Champion Racing Oil/RM Racing Lubricants Central PA Sprint Cars point series show on Saturday April 13th. Danny Dietrich leads the points over Lucas Wolfe and Ryan Smith.